"Sculpture, panting, and furniture from the 15th to 18th centuries. In particular: Collection of late Brabançon Gothic sculptures. Collection of terra cotta drafts and sketches (bozzetti), plaster and marble works by the sculptor Lauret Delvaux (1696-1778). Brussels tapestry. Musical instruments. 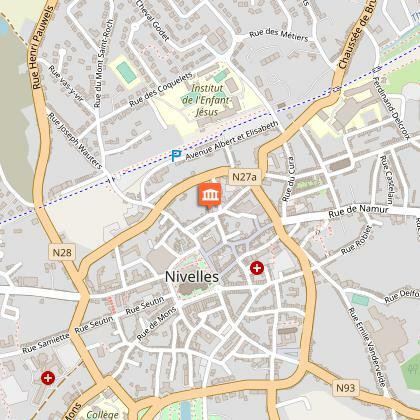 Nivelles furniture. Second floor devoted to prehistoric and Gallo-Roman archaeology: development of tools and technologies, aspects of everyday life. The objects come from excavations carried out in the region by the museum. In particular: excavations in progress on the Bons-Villers Gallo-Roman site at Liberchies (Pont-à-Celles). Large corner house built in 1764 to house the Trinitarian refuge of the Orival priory. Fine masonrywork on the façade in brick and blue stone, covered with Virginia creeper, preceded by a paved courtyard with access through two monumental gates. Entrance door, balcony, stucco ceiling décor, and Louis XV-style wooden staircase. A listed monument since 1956. Nivelles CPAS archives, Ancien Regime section, relating to hospital establishments of the Sainte-Gertrude Chapter of Nivelles."